Well, as my “What am I?” quzzes go, this one is so painfully obvious that I hesitate to put it up, but hey, maybe I'll stump someone for a few minutes. Leave your guess in the comments... as always, I'll withhold comments from publication until I give the answer. Well, it looks like a grounding rod, thats easy but the rest is a guess for me. A fiber optic connection? Hi there, are these fiber loops for connecting networks between floors? 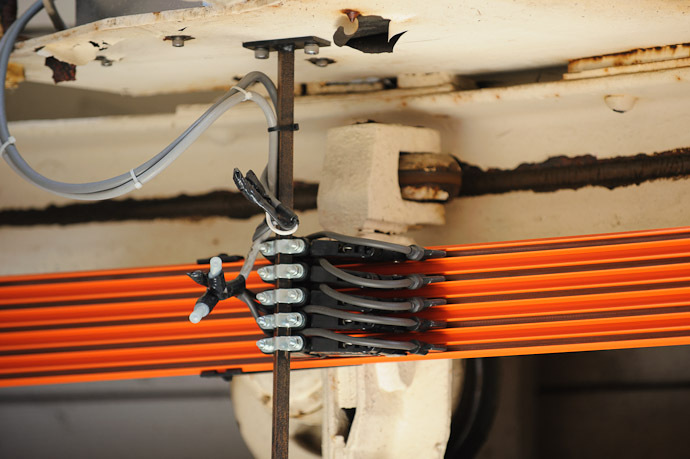 Slip rails and brushes to transfer power to the movable section of an overhead crane. Some type of power or information transfer for a subway car? I’ve posted the answer here.